Garnier Light Complete Multi-Action Brightening Scrub. I got this when I noticed that my face started to get better and exfoliating will no longer aggravate it. I use this only when necessary (aka when I remember) , once a week at most. 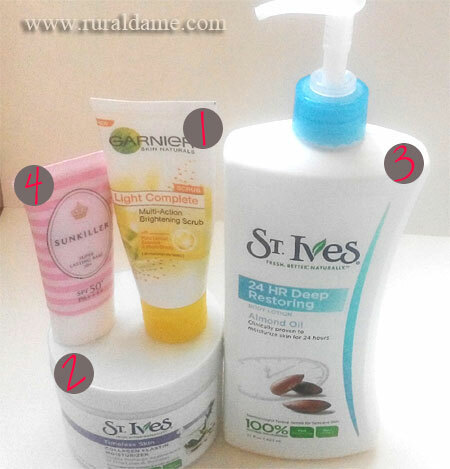 St. Ives Timeless Skin Collagen Elastin Moisturizer. I have ready good things about this in a beauty forum and I’m hoping that it will give me positive result like it does to other girls. Initially, I used this every night only and avoided this during daytime since my sunblock was making my face oily enough. However, the new sunblock I got is formulated for people with oily skin and somehow it makes my skin dry so I started applying this in the morning as well. St. Ives 24 Hr Deep Restoring Body Lotion. Since last year, I have been trying out different variants of this lotion. Aside from being a great product from the brand I trust, it is also affordable.I got more for what I paid for. Sunkiller Superlasting Base SPF50 PA+++. This is the new sunblock I mentioned above. Apart from its sun-protection features, it is also serves as makeup base ideal for oily skin. My favorite beauty bloggers are raving about it so I got one for myself.